7 artists, with different disciplines, techniques, mediums, and studios, all under one roof. 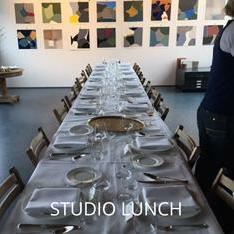 The Studio event invites you to attend a luncheon, cocktail or dinner, all as an opportunity to engage in dynamic conversation, and for the artists to share their passions and foster conversation through their creations. They also open the doors to their individual art spaces, allowing a sneak peak into their work processes, making it a truly different experience from a gallery event. They look forward to seeing you at their next event!